Yoga is a way to unite the mind, body and spirit. There are three main elements of yoga: poses (asanas), meditation (dhyana) and proper breathing practice (pranayama). When these three elements collaborate, you enjoy a journey of deep spiritual insight. Yoga is an age-old practice born in India. It aims to radiate peace and tranquility throughout the mind, body and soul. The unique combination of breath control, simple meditation and the adoption of specific body poses can be great for your overall health. It can help you stay in shape, fight obesity, reduce stress and calm the mind. However, when it comes to relaxing your mind and body with yoga, some poses are particularly effective for promoting body relaxation and encouraging restfulness. 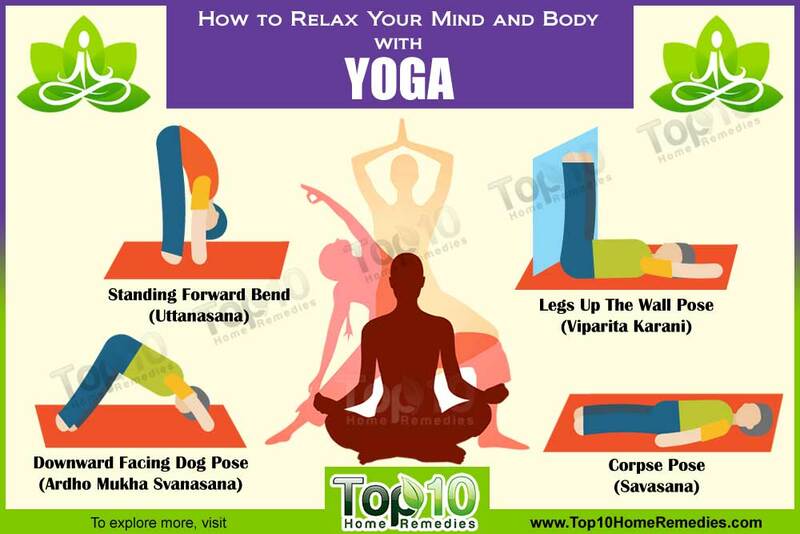 Here are some of the yoga poses that can help relax your mind and body. Child’s Pose is a popular yoga posture that can help calm the mind, relax your body, ease stress and release tension. It is also good for the nervous system and lymphatic system. This pose is highly recommended for those who suffer from stress, anxiety, neck pain, back pain and high blood pressure. Kneel down on a yoga mat or carpet and rest your buttocks on your heels, keeping your knees roughly hip-width apart. Keeping your spine elongated, slowly bend your torso forward to rest your chest on your thighs. Rest your forehead on the floor and stretch your hands out above your head with palms facing down or up, whichever is more comfortable. While in the pose, take deep breaths to calm the body. Stay in this pose for 1 to 5 minutes. Standing Forward Bend, also referred to as Standing Forward Fold or Forward Bend, is another popular yoga pose that helps calm your mind and body as well as relieves stress, headaches, anxiety, fatigue, mild depression and insomnia. In fact, this pose is an essential element of Sun Salutations, which helps stretch and rejuvenate the whole body. Practicing this pose improves the functioning of your liver and kidneys, while also helping digestion, asthma, sinusitis, high blood pressure, osteoporosis and infertility. Stand on your yoga mat with your feet together or slightly apart with your toes facing forward. Exhale and bend forward from the hips, relax your shoulders and extend the crown of the head toward the floor. Place your hands on the ground with your fingertips in line with your toes and press your palms on the mat. Shift your weight forward onto your toes, keeping the legs as straight as possible. Take deep breaths and feel the backs of your legs opening. Remain in this position for up to 1 minute. Next, place your hands on your hips, inhale and slowly return to a standing position. Note: This yoga pose may not be suitable for those with lower back problems. People with high blood pressure should also avoid practicing this pose. This is a restorative yoga pose that helps calm your mind and body and reduce stress. In addition, it improves blood circulation, treats menstrual cramps, relieves swollen and tired feet, improves digestion, heals backaches and eases symptoms of mild depression, anxiety and insomnia. It also slows the aging process. Lie down on your back near a wall and practice deep, steady breathing. Exhale and put your legs up against the wall while keeping your spine straight. Place your arms by your sides with palms facing up. Take deep breaths for a few minutes. To release this position, bend your knees and roll onto one side. Take a few deep breaths before sitting upright with your back against the wall, then slowly rising to your feet. Note: Do not practice this yoga pose during menstruation. Also, it may not be suitable for people suffering from glaucoma and high blood pressure. The Reclining Bound Angle Pose is a very relaxing yoga posture for both beginners and experts. This pose relaxes the body, mind and spirit as well as relieves symptoms of stress, mild depression and anxiety. It also stretches the groin and inner thigh muscles and helps lower blood pressure. Sit up straight on a yoga mat with your legs together and extended straight out in front of you. Keep your spine straight and your knees resting as close to the floor as possible. Exhale and slowly lie down on your back. Using your hands, gently pull your buttocks away from each other. Bend your knees, draw your heels toward your pelvis and keep your feet touching the floor. Place your arms comfortably by your sides with palms facing up. Allow your body to relax, taking deep breaths for up to 5 minutes. To get out of the pose, start by drawing your knees back together, slowly roll to your side and then with the support of your hands raise yourself up into a seated position. Note: Avoid practicing this yoga pose if your have a knee, lower back, groin, shoulder or hip injury. This is one of the poses in the traditional Sun Salutation sequence. It is also an excellent yoga asana all on its own. This pose stretches the shoulders, legs, spine and whole body. It rejuvenates the body, calms the mind, fights fatigue and relieves depression. It can also improve the immune system, digestion and blood flow to the sinuses as well as relieve back pain, headaches and insomnia. This pose is particularly helpful for those who have a tendency to crouch their shoulders when stressed. Come onto the floor on your hands and knees. Your palms should be flat on the floor with fingers spread in front of you. Keep your feet in line with your hands and stretch your arms forward, keeping your elbows straight. Exhale and lift your knees away from the floor, lift your hips and push yourself back to create an upside-down V pose. Take deep breaths and relax your head and back of the neck. Stay in this pose for 1 to 3 minutes. Then, bend your knees to the floor with an exhalation and rest in Child’s Pose before standing up slowly. Note: Avoid practicing this yoga pose if you have severe carpal tunnel syndrome or high blood pressure. Plus, it may not be suitable for people with back, arm or shoulder injury. This particular yoga pose helps reduce stress from all the muscles in the body and provides complete relaxation when done after a workout or after performing other asanas. It relaxes the entire body, calms the mind, reduces anxiety, alleviates mild depression and improves sleep. It also helps lower blood pressure, reduce headaches and fight fatigue. Place your hands next to your sides, slightly spread out with palms facing upwards. Keep your legs slightly apart and breathe slowly and deeply from your abdominal area. Close your eyes and concentrate on relaxing the muscles of your body as much as possible. You can maintain this position for 5 to 15 minutes. To release this position, take a few deep breaths, slowly roll over to one side and with the help of your arms raise yourself to a seating position. Caution: Before practicing any of these poses on your own, attend a yoga class to learn the correct way to practice yoga postures. Always bear in mind that yoga poses will only benefit your body and mind when done correctly.